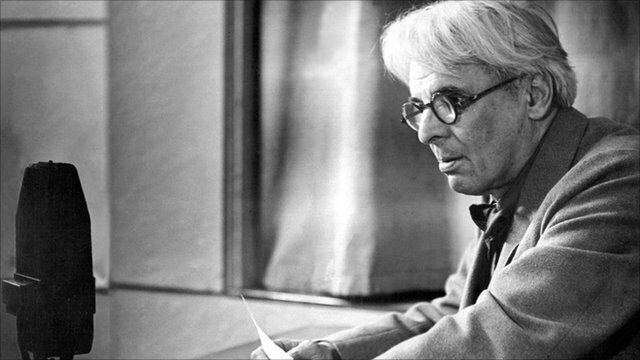 A slam poetry competition will take place in Thoor Ballylee, the former home of WB Yeats on Saturday October 15. Performance poets are invited to apply for one of 10 places at the event. This is the first competition of its kind to be held at the tower house. This event will be MC-ed by Galway poets and former Cuirt Grand Slam winners Elaine Feeney and Sarah Clancy who, jealous of the attention being given to the other poets, may decide to perform some of their own poems in the interval. Prizes are available, for those who like fumbling in the greasy till, including a first prize €250, second prize of €100, and third prize of €50, sponsored by Poetry Ireland. All poets who perform and all judges will also receive a copy of Poetry Ireland Review Issue 116: A WB Yeats Special Issue, also sponsored by Poetry Ireland. There will be 10 slots for poets to perform at this event, with the contestants selected in advance by Elaine Feeney and Sarah Clancy based on submissions. Entries for this event are open now and poets wishing to enter must send a poem of their own in any format — text, video, or recording — to sarahclancygalway@gmail.com on or before October 4. 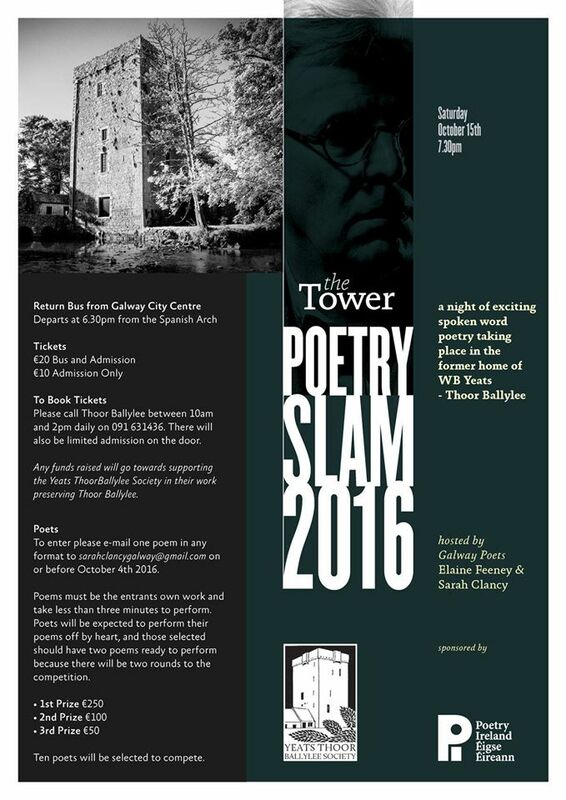 All submissions must include ‘Tower Poetry Slam Entry’ in the title of the e-mail. Each poem must be three minutes’ duration or less. There will be two rounds, with the five highest scoring poets from round one going through to the second round, after which the winners will be decided. Qualifying poets must perform a different poem in the second round. In each round the judges will be selected from the audience and their decisions will be both subjective and final. Poets are expected to perform their poems without using a script and scoring will reflect this. Poems must be the performer’s own work and not have been previously published in book form nor have been the winning poem in any other slam competition. Transport from Galway will be available by bus which will depart from the Spanish Arch (in front of Jury’s Hotel ) at 6.30pm and will return to there after the event. Tickets for bus and admission are €20, €10 for admission only, and there will be no admission charge for performing poets. Refreshments, including wine, will be available for purchase on the night. To book tickets call Thoor Ballylee between 10am and 2pm daily on 091 631436. Or email yeatsthoorballylee@gmail.com. There will also be limited admission on the door. 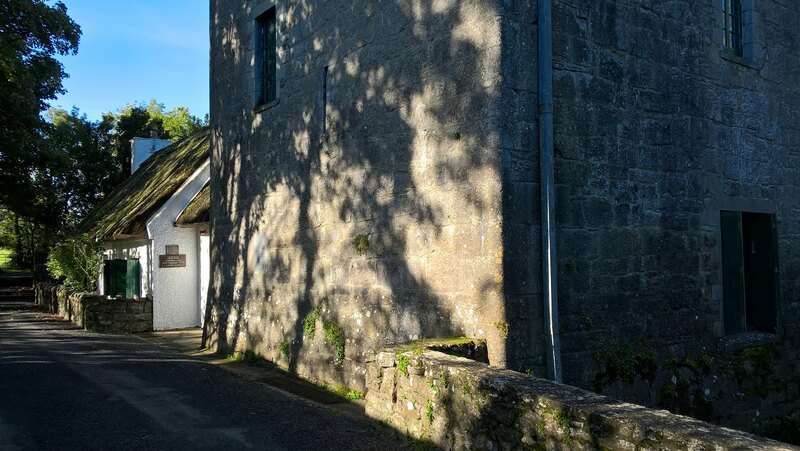 Any funds raised will go towards supporting the Yeats Thoor Ballylee Society in its work preserving Thoor Ballylee. Hear W.B. Yeats read his own verse here! As he says, he reads with great emphasis upon the rhythm.